Rainbow Dash stood at the docks, letting out a soft sigh to herself. This was not awesome. Oh, sure, a cruise sounds nice and all ... and it was nice of Rarity to invite her on one ... but this was definitely a RARITY cruise. Some sort of travelling, airborne fashion show taking in the sights of the north. Which was right up Rarity's way, except for the little thing where Rarity hadn't had the best history with travelling through the sky. More specifically, every time she was more than a few hundred feet up, she couldn't seem to STAY up, and ended up plummeting to her death. Of course, Dash had always been there to catch her every time she'd fallen, so she'd asked Dash to come along just to make her feel safer. And it was true - Dash was Awesome. And a hero. And all that. And she couldn't blame Rarity for wanting such an awesome pony along. If only the cruise didn't sound so DULL, though. She looked up in the sky where the airship was maneuvering towards the third story dock, sailors already tossing out ropes and pegasus ponies flying out to secure them. And where was Rarity? This was her idea, and she wasn't even here yet? Dash nudged her one small bag. Rarity'd said to not worry about how much she might want to take - Rarity would handle the fees. But what all did she expect Dash to take? Toothbrush, a Daring Do book to read (she'd only read this one three times, so it was still pretty new), and a scarf cause the weather up that way was cold. Her flight goggles and helmet so she could practice her stunts along the way. It didn't exactly take up much space. But then, Rarity's vacations tended to look like she was planning to move in for good ... she was sure any moment now she'd see Spike stumbling along with a giant pile of boxes. Or the stallions next door to the Boutique. Rarity was able to get them to do anything she wanted. "I hate waiting," Dash grumbled. She should have just shown up, in Rarity's terms, 'fashionably late'. Rarity sure was! There were only so many times a mare could experience free fall before she developed a negative association with being high in the air. That's not to say that Rarity had become afraid of heights; on the contrary, to her there had always been a romance to the idea of majestically soaring through the sky. Rarity was just woefully aware that she had not have particularly great luck with moving through the air herself. She'd hopefully also be a model, if Rarity could talk her into it. She hadn't really said much to Rainbow about that part too much and wasn't sure how she might react to it. Rarity had prepared a variety of quite fetching new styles for the tour though, and she was sure they'd all look just fabulous on her colorfully-maned friend. Her designs were sure to make a big impact in the show when worn by such a fit, lean, bright-eyed, colorful and cute mare as Rainbow. Of course... there was more on Rarity's mind than just safety and fashion. She hadn't really thought about it until after she asked Rainbow to come along with her, but essentially it would be her and Rainbow going off on a cruise together alone. They would be together for weeks and were to even share a room on the ship. Rarity couldn't recall very many times when it had been just her and Dash doing something... and thinking on it unearthed some old awkwardness. Rainbow Dash was... disarming, somehow to her. Through so many misunderstandings and particular happenings her thoughts had spun in her head in such a torrent that it was hard sometimes to even think what Rainbow meant to her truly. Generally she would just turn flush and try desperately to think of something else if she could. Rarity had done a few travelling fashion shows now. She didn't honestly care for many of them, as she disliked having to ever close the Boutique for an extended period of time. Ultimately, she knew that shows like this were good for business in the sense of promotion, but it was still hard to be away for more than a day or two. To attempt to make it up to herself, Rarity would bring along much of her supplies so she could work while on the road. She never knew when inspiration would hit her, after all, and if she came up with something good and was able to produce it right away, she could showcase it in the show soon after. It was for this, that Rarity was a little late to join Dash. It took time to pack all of her fabrics and supplies and design materials, as well as the outfits she had prepared for the show itself. Ultimately Rarity showed up at the airship dock wearing a summery hat and scarf, accompanied by countless overstuffed bags and suitcases. She knew how it looked to travel with so much luggage, but only one of the bags was actually clothes and care items for herself while the rest were essentially a mobile version of the boutique. "My apologies, Rainbow darling!" Rarity called out as she finally caught sight of the other mare, clearly waiting for her. She was pulling along all of her bags on a little cart. She was doing her best, but it took time and effort to move the thing what with the wright of it all. "Moving all this took longer than I anticipated..."
Martini Paradise watched as the large airship was lowered to the waiting dock with anticipation. She knew as soon as the gangways were lowered she would have to get right on board along with the rest of the staff that was hired for fashion show that was being showcased aboard the luxury ship. She didn’t have to do any of the modeling herself, as if she could be a model, but to simply run the fancy drink bar they have aboard. As far as contract jobs go for the itinerate bartender unicorn, this particular gig was better than most The pay was actually pretty good, meals were free, and she would even have a small allowance to enjoy herself with aboard the ship’s many amenities after hours. All she had to do was what she did best, make and serve drinks. Sure it was going to be for the typically high fashion show crowd, who trended towards the haughty and dismissive, who often weren’t interested in talking to the bartender anymore than absolutely necessary, but the bits she could save from this gig was more than worth putting up with a few pernickety ponies. Martini trotted towards the edge of the dock as the gangways were finally lowering she noticed a familiar site, a rainbow maned pegasus who she distinctly remembered from last temp job at the R.E.A. officer bar called Ponyland back in Canterlot. The excitable pegasus was one of several who helped battle a particularly fierce wild storm from the Everfree who later recovered at the bar late that night. As Martini recalled, she was a Wonderbolt fan, or at least a fan of a particular light blue stallion of the famed flying group. The cyan flyer was flanked by a white unicorn who the barmare didn’t know; she was exceptionally beautiful though and they seemed like friends although on the surface it wouldn’t look like they had much in common. There was no time for introductions though, perhaps she would get to run into Rainbow Dash after hours in the ship’s promenade, for now it was time get aboard and make sure the bar was in order and all the ingredients were ready for whatever her patrons desired. She had just been crouching and spreading her wings, ready to go see if the makeshift course was as awesome as it looked from the ground, when Rarity's voice pulled her back. "Oh! Rarity! You made it!" she chirped brightly. Earth ponies on deck were reeling the ropes in, pulling the grand airship snug up against the side of the dock, and a faint reverberation shuddered through the balcony as it connected. Rainbow Dash looked up and down at Rarity's great big pile of gear, rolled her eyes ... "Is there gonna be room for US in the room? Airship cruise rooms aren't known for their size!" Her cocky grin split her muzzle, letting Rarity know she didn't mean any harm by the teasing, even if she didn't understand the need for so many boxes and bags. "Sure you didn't forget anything? Like the kitchen sink? You got enough stuff that the Cutie Mark Crusaders could be stowing away in there and you'd never notice!" "Oh! Rarity! You made it! Is there gonna be room for US in the room? Airship cruise rooms aren't known for their size! Sure you didn't forget anything? Like the kitchen sink? You got enough stuff that the Cutie Mark Crusaders could be stowing away in there and you'd never notice!" Rarity knew Dash well enough to not be the least bit surprised that she started immediately by cracking jokes about the number of bags she had chosen to bring along. Rarity had consciously wondered what sort of wry comments she'd get while she had been packing anything. Rainbow's grin was a comfort through it. It told Rarity that while she didn't understand her need for so many things, she wouldn't disparage her for it like Applejack might. Applejack liked things functional and contained to such an extent that flourish seemed almost to offend her. Rainbow on the other hand, just found the apparent excess mildly amusing. She wondered if perhaps that wasn't because Rainbow was given to excess herself, if in completely different things. "I do hope not," she said jokingly, meeting Rainbow's grin with one of her own. "I don't think the antics of my sister and her little friends would be very much appreciated by paying cruise patrons!" She let out a warm laugh and then gave a small nod. "But I do apologize for all of this. I truly did my best to only bring along what I felt was essential, but.. an artist can only make so many sacrifices for the sake of her comfort." Pulling the small cart with all her bags stacked up on it after her, she started toward the ship itself. "But why don't we go ahead and get boarded now, darling? I know I'll be glad once I have all this stuff unloaded so I can relax...It truly wasn't much fun pulling it all the way here from the Boutique.."
Rainbow Dash rolled her eyes. "And by 'essential' I'm sure you mean you brought ONLY two extra sewing machines, only ONE bag full of spools of thread, and only twenty seven different varieties of red ribbons that aren't actually red instead of the normal fifty two." She shook her head. "You coulda just asked me to meet you at the Boutique instead of here - I'da helped ya carry it all, ya know." She matched movement to word, grabbing the top several bags from the pile and then floating - nope, too heavy - walking towards the airship. She hoped Rarity appreciated the sacrifice she was making here! Walking. Ugh. She hated things touching her hooves. Happily, it wasn't that long of a walk before the porters took their bags from them. She spotted a familiar unicorn in the crowd and smiled and waved at her - she couldn't remember her name, but she remembered that the unicorn had kept her bar open well past closing just to give some tired weather ponies someplace to recover after a horrible storm. Then boring again... floating around, waiting for paperwork and keys and all this stuff to be taken care of... a sloooow procession through the airship's hallways. The porters dropped off the giant mound of Rarity's bags and trunks, and one held out his hoof. "Nice work!" Rainbow Dash said, slapping his hoof with her own. Cool ponies they had working here, looking for hoofbumps for jobs well done. She lifted her own hoof high. "Send it back!" she crowed eagerly ... and waited, at the porter's confused expression ... she pointed at her hoof. "Don't leave me hangin', dude!" Martini Paradise took one last look about before she entered the airship to begin her new job; hoping to spot she anymore ponies she recognized, but alas everypony else was a stranger to her. Then out of the corner of the pink unicorn mare's eye, she noticed one familiar pony she noticed from earlier, Rainbow Dash, waving in her direction! A customer who remembered her! That always made Martini feel a bit happy, it means she made an impression. With an enthusiastic smile she excitedly waved back to the rainbow maned pegasus; perhaps she would see Dash at the bar once again, along with her very pretty unicorn friend. "Staff needs to be all aboard now!" A periwinkle unicorn stallion bellowed through his megaphone to any remaining staff outside. Martini hurried in, there was time to pony watch behind the bar once the festivities started. "And by 'essential' I'm sure you mean you brought ONLY two extra sewing machines, only ONE bag full of spools of thread, and only twenty seven different varieties of red ribbons that aren't actually red instead of the normal fifty two.You coulda just asked me to meet you at the Boutique instead of here - I'da helped ya carry it all, ya know." Rainbow's teasing made Rarity sigh. She was pretty close in most cases. She did have not two, but one extra sewing machine packed, as well as several different shades of red thread. She was conscious of the fact that it did appear as excess, even as she would attest that all of it was essential to her creative process. The rest of Rainbow's words, however, made her smile. She was happy to hear that Rainbow would have gladly shared the burden of helping her with all her things. it didn't surprise her. Rainbow was unwaveringly loyal to her friends and willing to do practically anything for their sake. She'd have obviously been willing to help her with her bags. Rarity hadn't asked her only because she felt she was already asking so much of her. "But I've already asked so much of you, Rainbow darling," Rarity said as Rainbow took over moving several of the bags. "Selfishly making you up weeks of your time all just to accompanying me on this fashion thing..." she added with regret. "I wouldn't dream of forcing you to drag all these heavy things I need across Ponyville as well! It's important to me that you relax and enjoy yourself on this cruise as much as possible..."
"Nice work! Send it back! Don't leave me hangin', dude!" Rarity watched in stunned silence as they brought the bags to the porter and Rainbow seemed to do her best to offend the poor stallion. She shook her head. "Oh, Rainbow, dear, whatever are we going to do with you..." she breathed out quietly through a sigh as she watched the display. Rainbow truly was a marvel sometimes. She was fairly respected and esteemed--leader of the Ponyville weather team, Wonderbolt Academy student--it was a marvel that it seemed that her understanding of basic social cues was not far removed from that of a child. Luckily Rarity was there to set things right for the hard working gentlecolt. She reached quickly into her saddlebag and fished out a gem. Rarity always had lots of gems on her just for occasions like this. Gems were plentiful to her always as she could locate them easily with her magic. Finding suitably valuable ones was sometimes difficult, most of the common variety not being worth much beyond their aesthetic use in dressmaking, but her gem hunts usually uncovered at least a few gems that had worth. The one she found in her bag was a quite nice and pure little sapphire, which could probably be exchanged for a nice little pile of bits. "Here you are, sir," she said as she slipped the little gem into the stallion's pocket with her magic. "Thank you so much for your trouble," she added politely, smiling brightly at him. She started to move away from the porter then after prodding Dash into motion after her. Next to her, she moved in close and whispered, "Rainbow dear, when somepony in the service industry does something for you, it's important to recall that they're looking for something a little more tangible than a hoofbump in return..."
She didn't want to dig into Rainbow too badly. As silly as what she had done had been, it felt wrong of her to really make too much out of the incident. All that was important was that she did her best to correct the behavior for the future. "Knowing when to bestow gratuities unto others is a very important skill to learn if you don't wish to appear rude," she added, still at a low whisper. Dash held her hoof up through the exchange, looking ... well ... a little lost. She sagged as Rarity motioned her to follow, and finally brought her hoof down to the floor, and walked along after her unicorn friend, feeling rather a bit put out. The gentle lesson in politeness, though, was the last straw. Her wings flared out, and she cried, "Rude!?" Then, at Rarity's scandalized expression, she lowered her voice to a hiss. "If anypony was rude, it was him! I had my hoof up and he left me hoofbumpless! That's totally rude! I mean, returning a hoof bump is basic etiquette! It's the foundation of amicable interactions! High hoof? Hoof bump! Bam! Good will! I swear, the fancy sorts you usually hang out with would be way friendlier if they had a few more hoof bumps in their lives. It's not all sedate like hoof-shaking. You gotta get emotion into it! Even if you try to fake it, you start feeling better just cause you're havin' fun!" The porter had left while Rainbow Dash had been on her quiet, under-voiced tear, and she tossed herself onto the room's single bed. *fwump* *bounce* She had the beginnings of a good amateur pout going on - nothing compared to Rarity's expert dramatics, but the wings added some flair to the movement. Of course, she promptly ruined it by getting distracted. "Wow, this is a pretty nice-sized room for a cruise! You've got the star treatment! Pretty fancy and cozy! Oh, hey, check it! They left us a basket of snacks! Nice! Is there another room for me or are they bringing in a cloud bed to float in the corner or what?" "Rude!? If anypony was rude, it was him! I had my hoof up and he left me hoofbumpless! That's totally rude! I mean, returning a hoof bump is basic etiquette! It's the foundation of amicable interactions! High hoof? Hoof bump! Bam! Good will! I swear, the fancy sorts you usually hang out with would be way friendlier if they had a few more hoof bumps in their lives. It's not all sedate like hoof-shaking. You gotta get emotion into it! Even if you try to fake it, you start feeling better just cause you're havin' fun!" Rarity bit her lip and gave a small sigh. Honestly, Rainbow could truly be egregiously lacking in her awareness of a situation. Sometimes it seemed as if even Pinkie Pie had a better awareness of societal norms. This was fine though. It just meant that Rarity would have to take her by the hoof and show her the way. By the same token, it was somewhat reassuring to see Rainbow Dash use words like "etiquette" and "amicable". That was proof that she could learn a smidgen more class, if ever there was one. "Come now, Rainbow darling," she said, as her eyes went wider. "It's not a matter of fanciness at all! There is nothing wrong with a good hoofbump, but every thing has a time and place. It's simply common courtesy to give to others who are there to do something for you and whether you're talking waiters or porters or valets or anything else of the fashion, in service jobs, it is expected for a gratuity of at least a few bits to be given once they've served you." Rarity was honestly glad to see the room change her friend's mood. Though it was for work, Rarity very much wanted this trip to be fun time for them both after all. She truly did not want to snipe at Rainbow Dash over etiquette. She got enough of that any time she visited with Applejack. "How curious..." she said. "I'm sure I made it very clear when I booked my room on the ship that I was planning to share it with a very dear companion..."
She poked the bed with her hoof, admiring its plush softness. "I had expected they'd give us two... but...well... at the very least, it is a large enough bed for two..." Rarity raised a hoof to her chin and gave a little sigh. "Well, I suppose it wouldn't be the first time I've ended up sharing a bed with another mare," she added somewhat absently, recalling her sleepover with Twilight and Applejack. If she could bear to sleep in a bed with Applejack for a night, she couldn't imagine that having to do the same with Rainbow Dash would be so bad. "But if the bed situation bothers you, Rainbow, I would be pleased to speak with somepony and see if there is anything else available for our accommodation." She looked at her friend a moment with a softened smile.. "Though you are right... it is otherwise a very fine seeming room... "
Rainbow Dash rolled her eyes at Rarity's lecture. It wasn't like she'd never tipped a pony before. She wasn't used to ponies *asking* for it. And it still was rude to not return a hoofbump! It was like Rarity expected Dash to be just like ... well, her. Heh. Fine, then! She knew how to be fancy! What would Princess Veil from the Daring Do books say? Dash struck the most fancy, airy pose she could, laying on her side on the bed, and in a light voice, with a flip of her wing, she replied, "Oh, I'm sure it will be fine, love. Why would I want a grubby little makeshift bed when such luxury is available here to be shared? Unless you are nervous about sharing a bed with me, darling." She gave a little giggle. She sounded so ridiculous! "So, Rares, did you want to unpack, or should we head out and explore the ship? Is this the sort of cruise that has a 24-hour buffet?" "Oh, I'm sure it will be fine, love. Why would I want a grubby little makeshift bed when such luxury is available here to be shared? Unless you are nervous about sharing a bed with me, darling." Rarity instinctively went flush. She couldn't entirely explain why. She was perfectly aware that Rainbow was mocking her. She had heard the pegasus do her little impersonation of her before, and of course she never minded such things. Rainbow seemed to enjoy teasing her, and she was more than happy to simply take it and try and turn it back on her at the soonest chance. All the same, she couldn't help but blush, and not out of any kind of shame. Just hearing Dash make something out of the idea of them sharing a bed caused her to give pause. The familiar awkward train of thoughts that had once lead the unicorn to conclude that Rainbow had feelings for her breezed through her mind and caused her eyes to fight their way to the far corner of the room. "O-of course not, Rainbow darling. You know that I'm not shy, especially with one of my dearest and most trusted of friends," she said in a softened voice, unable to fuss out any kind of sarcastic quip that the other mare might have sooner expected. Rarity gulped down some air and then gave a quick outward sigh, glad that the conversation had moved on before becoming more potentially awkward. She nodded. Though she had to admit that she was eager to unpack and set up her workstation, she was more eager for a chance to leave the room before she got lightheaded. "Oh, we just arrived. We can worry about unpacking later," Rarity said, shaking her head. "I believe the ship has fairly complete service. They have both a buffet and a bar, if I can recall." She stood and moved toward the door. "Shall we go and see what we might find, Rainbow?" she asked, looking back at the rainbow-maned mare. Rainbow Dash was a little bit surprised, there. It was hardly the first time she and Rarity had traded teasing remarks, but even in all the times she'd mimicked Rarity's overly fancy manner, she'd never gotten Rarity to blush before! So ... what had she done differently this time, and could she do it again? She was going to have to figure this one out! It had so much pranking potential! She grinned impishly at Rarity, her eyes sparkling, sharing her delight at having scored a point, but politely she didn't rub it in. See? She could learn this stuff! "Yeah!" she said eagerly, following after and stepping out into the hall, where she lifted into the air again, her wings flapping slowly enough to glide along down the corridor with Rarity. "I'm hungry! I'm always hungry. But let's see if they've got any cider at the bar! I doubt it's Sweet Apple Acres stock, but ... one can always hope!" She hummed happily, floating a little ways ahead of Rarity, her tail swishing in an almost catlike manner as she struggled not to go zooming ahead of Rarity in a search for food and drink. "So, I don't think I've ever been to one of these with you before! How do these things go, anyway?" "Yeah! I'm hungry! I'm always hungry. But let's see if they've got any cider at the bar! I doubt it's Sweet Apple Acres stock, but ... one can always hope!" "Oh, Rainbow dear... I swear that when it comes to cider, you have a problem," Rarity said, giggling. Rainbow's cider obsession was well known in Ponyville. Along with the release of new Daring Do books, the start of cider season at Sweet Apple Acres was one date carefully marked on her calendar and carefully counted down to from months away. There was nothing to say for it but that it was adorable. Rainbow really came alive when there was that girlish excitement in her eyes. Rarity had no problem with checking out the bar, regardless. She enjoyed a good drink after all, and it seemed like a good way to settle in. And really, even if Rainbow did drink the bar out of cider, this was a sort of vacation for them--a working vacation for Rarity--but having fun was a huge point of it all the same. "But let's go check out the bar. We can eat later," she nodded in accord with the other mare's decision. "So, I don't think I've ever been to one of these with you before! How do these things go, anyway?" "You mean the bar...?" Rarity started somewhat absently before almost immediately realizing this was exceedingly silly. Even if her and Rainbow had never really gone drinking together at a bar, Rainbow wouldn't need to be told how that would go, would she? "No, the cruise..." she corrected herself with a slightly embarrassed giggle. "Hmm, well, I couldn't entirely tell you. I've been a part of travelling fashion shows before sure, but never one quite like this, where it comes in combination with an airship cruise." "Other shows I've featured with had me travelling non stop all across Equestria via train car, me having to pay my own fare each stop along the way. Compared to that, this one feels like it will be much more relaxing," Rarity said, remembering all the rough and stressful nights spent sleeping on trains worried about how the next stop in the tour would go. "But in many ways it will be similar. The airship will take us across Equestria, to the bigger cities in the fashion game. They'll put on shows each stop along the way where the featured designers will have their designs modelled." "It's nothing like Manehattan Fashion Week, where there are winners and losers... the only judging will come at the hooves of the press and the fashion buying public," Rarity continued to explain. "Honestly, Rainbow, as fashion events go, this one feels as if it should be--barring any unforeseen complications, of course--low stress." She gave a small laugh as she recalled the full work station she had packed. "of course, that doesn't mean I plan on just taking it too easy. I want to ensure that my presence in the show is something special each step of the way!" OOC: Bramble said I should go next and set up the scene of the buffet and bar room. Rainbow Dash waved a hoof at Rarity's demurement. "Oh, of course. Everything you do is special, Rares." She faltered after that, several very memorable design flops coming to her mind. "Though I suppose some are ... more special than others..." She really, REALLY hoped that Rarity wasn't going to pull out one of those flops on this trip. She never knew how to tell Rarity that some of her designs were ... really bad. Usually they were gorgeous! She just had to hope this was the norm and not the exception. But then they were in the ... whatever the room would be called with the buffet and bar. She'd call it the lunchroom or maybe the ballroom, but she was sure that all these fancy ponies had some fancy, Pranch name for it. Why was Prance synonymous with fanciness, anyway? She inhaled deeply and grinned. "Mmmm, I smell some haybrowns!" she said happily, but started for the bar first. "I don't have a *problem* with cider, I just like it. But I guess it's a bit too early for cider, anyway... "
She leaned against the bar and automatically tossed a couple bits into the tip dish. "What's that one orange-juice drink called, Rares? Memesetter? Marmoset?" Then she finally actually looked at the barkeep. "Oh, hey! Hi! Nice to see you! Rarity, remember that one huge storm that came out of the Everfree and nearly flooded half of Equestria? Somewhere around two in the morning, we finished up with breaking it down to only an inconveniently strong storm and found ourselves somewhere over Canterlot, and this is the mare that kept her bar open 'til the wee hours just so we had someplace to crash." She thought about that a moment. "Or, you know. So we didn't crash. You know what I mean." She looked over to Martini, her eyes suddenly widening. "Oh, hey, you didn't get in trouble for that, did you?! What happened to that job?" Harmonic Dissonance cantered to the pier where the location of her next gig was set to go off. She wasn't sure how, but she got roped into playing classical on an airship for some fashion show. Natrually she had to wear her best for this. Not only what it an uptick gig, but it was for a fashion show. She had donned a silvery white long dress. She was sure most other staff would be wearing something similar to a tux or some sort of uniform, but as she was the entertainment, being dolled up should be alright, and she figured, no matter how nice she thought her dress was, there was no way it was anything near what would be displayed. At least I still got my chops for classical... She quietly thought to herself as she made her way up the plank onto the airship. Honestly this was Dissy's first time she had played for such an event. Usually, if it was classical, it was an orchestra, she was very out of her element looking at the gangplank and making her way on. She figured it would at least be a good experience, and hoped that the crowd wasn't all high hats and stiffs. She's played for those types of crowds far too often. She made her rounds, checking where pianos were and what sort. She first made her way to the main event hall, where the runway was set up. To her surprise there was a small area set up for her, and a baby grand piano. They clearly spared no expense for this. On an airship she had only expected uprights like she had learned on, not what she would usually play in a small hall. She opened the key cover and instantly started doing sound checks on the instrument. She took out her trusty hammer and made the necessary adjustments. It was clear that they rented the piano but nopony knew how to set it up right, but it wasn't terrible. It just didn't sound like it had been tuned for a spell. Once satisfied she made her way to the rest of the areas and found another piano in the buffet area, this time though it was an upright. This made sense, smaller area, and most bars if they have a piano it's an upright... She looked over and saw the bartender. She cantered over to her and smiled. "Hey! You got hired for this gig too, huh? Name's Harmonic Dissonance, pleasure ta meetcha! I hope ya don't mind, I gotta tune up that piano, so 'scuse the noise, but I tells ya what, in return I'll play for ya any tune ya like. Cool?" She hoped the bartender would be alright with a bit of random noise for a bit, if not she could have a problem. Playing classical on an out of tune piano is glaringly obvious, with jazz, she could make it work, make the imperfections part of the tune, but... classical even with interpretation was harder to miss notes on. "Oh, of course. Everything you do is special, Rares. Though I suppose some are ... more special than others..."
Rarity shot Dash a fat glance, immediately picking up the meaning of her words by her tone. "Now, now, Rainbow dear, I don't go around making a point of any of your more notorious crashes," she teases with a soft chuckle. She sighed calmly and closed her eyes a moment. "Though I will admit that after my win in Fashion Week, I was struggling quite badly. Inspiration can be such a fleeting thing sometimes..." She gave a laugh and shook her head. "Luckily I think I recovered what I was missing somewhere in those awful Aquellian swamps." She shuddered and then smiled a little as she recalled her perilous expedition into the Soggalong Swamp in search of the fabled Mist Prism Plant. That was an experience she would never forget. "Mmmm, I smell some haybrowns! I don't have a *problem* with cider, I just like it. But I guess it's a bit too early for cider, anyway... What's that one orange-juice drink called, Rares? Memesetter? Marmoset?" "It's a mimosa, Rainbow. Marmosets are a kind of monkey," Rarity said, laughing. "Quite a refreshing drink, if you ask me, especially if the right champagne is used. Allow me to buy one for us both," she said as she retrieved some bits. "A mimosa for each of us, if you will, dear," she said looking toward the bartender. "Oh, hey! Hi! Nice to see you! Rarity, remember that one huge storm that came out of the Everfree and nearly flooded half of Equestria? Somewhere around two in the morning, we finished up with breaking it down to only an inconveniently strong storm and found ourselves somewhere over Canterlot, and this is the mare that kept her bar open 'til the wee hours just so we had someplace to crash. Or, you know. So we didn't crash. You know what I mean." "Yes, I recall that storm. It was a frightful thing. 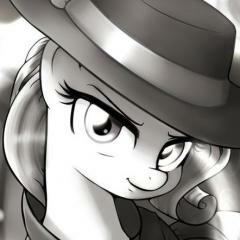 I was dreadfully worried for you out there," Rarity said in a low voice as she recalled that especially awful storm. "That was the sort of storm that could kick back and knock a pony out if she wasn't careful." Rarity smiled politely and nodded to the bartender. So she was an acquaintance of Dash? How small the world could be sometimes. "Hello there," she said to the bartender, who was a seemly looking unicorn mare. "A pleasure to meet you, Miss. I am Rarity, proprietress and courtier of Ponyville's one and only Carousel Boutique, and this mare is my dear companion. Thank you for accommodating her and the others when they so desperately needed it." When a purple earth mare in a silvery gown approached them at the bar, Rarity's eyes went to her. This mare had an unusual dialect for one at the event, which confused Rarity at first until the pony's words made it clear she was one of the musicians. "You must be quite the accomplished musician," Rarity found herself saying as she looked the pony's way. She meant it only politely; she was only positive the show would only hire the best musicians to please their guests, but you never know. "You're truly confident you could play any song she might name?" Martini Paradise was just finishing up shining the bar counter, the last act of preparation before the doors open for the guests when a purplish mare with a reddish mane made herself known. The bar mare seen her earlier from a distance inspecting the piano, relatively certain she too was hired for the show, but not as just part of the waiting staff but as the entertainment for what was looking to be a very fancy affair. Despite her formal appearance, the other mare sounded pretty down to earth and approachable. Martini gave a warm smile in return, “Martini Paradise, and yeah took this job as sort of a freelancer, the pay they were offering was actually pretty good, plus how often does one get to stay on a luxury airship for free? Pretty gnarly, isn’t it?” Considering most places Martini worked had old crystal powered jukeboxes that had an eclectic mix of tunes that sometimes could barely be called music, the idea of piano tuning wouldn’t bother her in the least. “Not at all, good ahead! I doubt it is going to bother me at all and I get the importance of making sure everything is perfect for a performance.” After all bartending too was an art, well, at least to Martini it was. Martini pulled down one of the mid-level champagnes - it was important to have good champagne for a mimosa, but you wouldn't want to use the best stuff, when it was going to get mixed with orange juice! Yet lots of bartenders went for the cheap stuff, assuming it wouldn't make a difference. She also pulled out a carafe of fresh orange juice, and the two containers floated up into the air, each pouring in equal measures into first one champagne flute, then the second, her magic keeping the spouts pouring cleanly into the slender glasses. She was glad the champagne had just come out of storage, because it was best to have it cold, and she wanted to start off this trip on the right hoof! Dash had never considered Rarity's fashion failures to be like her crashes. Still, her crashes were part of practice, and Rarity had a few of her own 'crashes' during some pretty public moments. Maybe Dash should give her more feedback, so she knew what to improve? Her clothes could sometimes stand to be a little ... cooler ... But she'd tried giving some awesome feedback that one time, and much as she liked the rainbow armor it'd produced, the opinion was perhaps not universally shared... though she was pretty sure that it was everypony else's outfits that had been horrible, and hers was only lumped in by association. She hadn't worn the rainbow armor in public since then, even though it was pretty awesome, so as not to remind Rarity of that time. "Oh, Rarity," she said lightly, "You know you don't have to worry about me. I'm always careful! Ish." She repressed an urge to give her fashion-frantic a friendly noogie, and instead just tossed one hoof round her shoulders briefly. "But glad to know you're thinking of me!" And then she forgot to remove it at Martini's words, wanting instead to hide behind Rarity a little instead. She glanced nervously at her friend, and blurted out - perhaps a little too loudly - "I wasn't hitting on him! It was professional interest! He's - I'm - that's - " She cleared her throat, and then pulled her hoof back, running it through her mane as she assumed a more chill posture. "I mean, we're cool. We're cool. We work together now." She tried to think of something more to add, but after an awkward moment of scrambling for words, she swiftly changed the subject. "I hope you get hired full time there, though! You're pretty good at that stuff. And you should make lots of tips and build your own awesomely cool bar, too. That sounds like a pretty good goal." Her brain was scrambling for something to add, still. And feeling like she was missing something. Oh! "Oh, hey, Martini, I didn't introduce you! This is my mare Rarity, and she's the sweetest clothing designer in Equestria! She's doing stuff for this airship cruise show thingy, and she's totally gonna win." A fancy looking mare overheard her statement to the bartender. Dissy never really thought of herself as "accomplished." Really she supposed she could consider herself that, she was a concert pianist who wrote her own orchestral piece when she was a filly. Which lead to her to be called upon for orchestration and composition jobs long after she stopped playing classical concerts. Even if it was just the arrangements... Still Dissy gave a bit of a giggle over the way the question was phrased. "If I can't play it perfect, I can wing it and improvise." The jazz mare said with a wink, "But really, if I heard the song, chances are I can play it. I have an ear for these things. Just like I'm sure ya got an eye for fashion, ya know?" She didn't know if this mare was a designer or a spectator, but she did seem the type so she took a shot in the dark, hopefully to get her to understand. She turned back to the bartender who gave her the go ahead, but now she was even more pressed for time, guests, like the mare who just talked to her were starting to arrive. "Heh, yeah. They got me here as a freelancer too. I just hope the crowd ain't a bunch of high hats. At least I know you ain't. No stiff I know uses words like 'gnarly'" She said with an air of fun, heck she had fun just saying the word 'gnarly' which was totally out of her lexicon. At the very least the rainbow maned mare seemed laid back. And on top of that the two seemed to know each other. "But if they are all like your rainbow maned friend over here, I think this should be a fun gig." Dissy said with a smile. Then the request came... Airship Pirates... she heard that song a few times. It was a popular club song, had a synth type thing going for the melody, which helped since that means they used a keyboard themselves. There was also some violin... Dissy was pretty confident she could play at least the melody... "Airship pirates? Well that's a new one... I think I might be able to pull it off though." With that, Dissy went off to the piano with her hammer in hoof. This one wasn't poorly tuned, it was in better shape than the grand at least. She began tuning the notes meticulously and getting them just right. When she was finally satisfied she smirked and thought to herself. Its time. Her first piece of the night would be rather unconventional. With the cover already up, she began striking at the keys. The decay of the notes didn't exactly work as well because of the electronic nature of the song, but it surprisingly translated well to the piano, and she had fun playing it. Man was she going to be sad when she's going to have to play the classical for the event. Hopefully she can take refuge at the buffet and play more modern music. After she finished playing it (with a few improved bits thrown in to extend it a bit), she got up from the piano and cantered back to the bar area, where the three mares were seeming still talking. "So how was that? It took me out of my zone a bit, but it was fun to do somethin different." Dissy said with a smile giving a wink to the fashion mare. "By the by Martini, I was told by the organizer that the food and drink for the staff, including the musical acts, was comped. As the barkeep I'm sure you could tell me for sure." Dissy turned to the mare that seemed to think she was overconfident in offering to play any song. "So... what'd ya think miss...." Dissy stopped... "Ya know, I don't think I caught your name... I'm Harmonic Dissonance, but most people just call me 'Dissy' on account of my name being a mouthful." She said cheerfully. "If I can't play it perfect, I can wing it and improvise. But really, if I heard the song, chances are I can play it. I have an ear for these things. Just like I'm sure ya got an eye for fashion, ya know?" Rarity nodded at the words from the musician. She could understand it by that comparison. "I suppose I see your point. Show me a style and in all likelihood I would be able to work within its bounds," she said. "And even if I never have before; it truly is a matter of improvisation." She shook her head quietly then. "But all the same, it's not like I would go around making a challenge out of the point." The mare went on to play the song requested of her, a rather exciting number which Rarity had never heard before, but she found resonated with her at a surprising level. Perhaps this mare was a little over confident, but like Rainbow, she seemed at least capable of backing it up. Speaking of Rainbow, Rarity decided to turn back toward her. "Oh, Rarity, You know you don't have to worry about me. I'm always careful! Ish.But glad to know you're thinking of me!" Rarity smiled fondly at pegasus' words. Rainbow crashed a lot. There was no denying this. She could still recall the time Rainbow smashed all the way through the boutique roof somehow and came away relatively unscathed. She could also recall that absolutely dazzling fright practice that had ended with the mare being a little less lucky. "I do, Rainbow. Next time you have a serious crash, it might be more than a fractured wing," she said softly. "I don't want to see you end up in the hospital again." She smiled at the bartender as she was given her mimosa and began to sip it, finding it refreshing as she'd expect. As Rainbow exchanged some words with the bartender, Rarity decided to exchange words again with the musician who had finished playing her song. "So... what'd ya think miss.... Ya know, I don't think I caught your name... I'm Harmonic Dissonance, but most people just call me 'Dissy' on account of my name being a mouthful"
"Harmonic Dissonance? That's quite the elegant name," Rarity remarked with some surprise. "You do have a considerable talent, Miss Dissonance," she said. "I am Miss Rarity of Ponyville's one and only Carousel Boutique. Charmed to make your acquaintance"
Rarity finished introducing herself only to find that Rainbow was introducing her to the bartender. Hadn't Rarity already done that just a moment ago? Perhaps the mare had been too distracted getting their drinks and dealing with the musician to hear her. Either way, she was glad for Rainbow's introduction... even if she wondered if Rainbow knew how Rarity being introduced as "her mare" might be misconstrued. Though... to be fair... in her own unheard introduction, she had used the phrase "dear companion". That thought elicited a deep blush and brought Rarity to drink a little more of her mimosa. "I-it's a pleasure to meet a friendly acquaintance of Rainbow," Rarity said to the barmare, nodding. "Especially one so talented," she added, nodding to the mimosa. "This drink truly is first rate!" Free room, free food and drinks, allowed to wander the ship after hours, and decent pay if the tips were good – which they usually were. All in all, not a bad gig. Better still, based on the ponies Martini met so far, maybe this show won’t be nearly as elitist as she had worried. Rainbow Dash preened under the recognition, her chest puffing out, and a big grin touching her lips. But she to ... as modestly as possible ... explain, "Well, I'm not a Wonderbolt JUST yet. I'm in the Reserves. Which is still fairly prestigious, of course, and is the first step towards being a full-fledged Wonderbolt. It's just politics, you understand, they have to put me through the stages just like everypony else. But yes, I do understand how fanfillies can be." At the return of the musician, she pondered for a moment if this was the sort of musician she was supposed to tip. Especially after the discussion earlier with Rarity, she wanted to show she wasn't rude! Oh, wait, had she tipped Martini?! ... ... ... yessss... yes, she thought she had. So as Harmonic Dissonance came back, she pulled out another bit and flipped it spinning through the air towards the musician for the excellent music, then sipped at her Mimosa as Martini went on to talk to Rarity. The pegasus pony glanced down at the glass in surprise. That was ... very good! She was used to these drinks having more of a bite - and Martini hadn't skimped on the liquor, she'd been watching. It must be the champagne she used. 'Smooth', she guessed, was the term for it? But then, at the sudden change of subject, she lost the puffed-out chest as she let out a snort of laughter. "Me? As a model? Oh, no, Rarity only goes for the best. Not that I wouldn't be *awesome* at it, but I think models aren't supposed to be awesome. Nor cool nor radical. They're, like, supposed to be delicate and refined!" She paused, then, the subject not having really occurred to her before now. "Who *is* your model this trip, Rarity? Do they have, like, uh ... " she gestured helplessly, then went for the closest hoofball term that might apply, "free agent models here, just in case something happens?" Dissy giggled at the fashion mare's misunderstanding of the situation. Though they were both art types the mode of the art was wildly different. Though there were gigs where she had to adhere to set lists, there were others where she was open to requests. This is probably where her confidence stemmed from. She quickly realized this 'Miss Rarity' was one of those whom she was hired to play for so she cleared her throat a bit to speak in a more professional manner, much like her parents had raised her to do. Though it still felt odd to her to be called 'Miss Dissonance.' With a wry smile Dissy replied back "You might not offer to take challenges openly, but would you turn down one if a pony came into your boutique and requested something outside of your norm? Your boutique is like my piano, it is hard to turn down requests, and as part of my job, I am sometimes required to take requests of the audience, so it is something I am quite used to." It still felt weird talking in a way that she rarely did, but... it was part of the job so she would probably be switching how she talked the entire time while on this cruise. And there it was the introduction. "Well Miss Rarity, if I'm ever in Ponyville, I may have to visit your boutique." Dissy said with a smile, even if she mostly played jazz clubs, looking good was part of every gig. "Please the pleasure is mine. Out of professional curiosity, I was told each designer chose their own music for the runway, which did you choose?" Dissy didn't really make note of the designer names so much as the order of the set list she was given. After all she didn't practice the designer names, only the music. Dissy smiled and quickly slipped into her usual mode of speech "Yah, in traveling Equestria ya learn to hear dialects ya know? I always found it kinda funny how most island ponies talk similar?" Then she mentioned talking in standard Canterlot dialect. "I know whatcha mean. The event organizer gave strict instructions on how to talk to the guests, at least I know I can let my mane down and relax at the bar. I don't enjoy talking like a stiff 24/7 if ya catch my drift." Then came the answer to her question. Comped everything? Dissy knew this was a good gig, but that's something else. She couldn't recall a time where *everything* was comped. Usually it was just drinks... "Everything comped eh? Well in that case might I get some Fet Loch whiskey if ya got it. Neat. I'm an easy mare to pour drinks for" Dissy said with a smile. Just then a bit found its way to Dissy's hoof from the mare whose name she heard was Rainbow Dash. "Uh... thanks... Dash was it?" While Dissy was used to getting tips, it was usually from the ponies who requested the music... This rainbow maned pony must have really dug the music. "Must have really dug the music then? If you'd like to hear something let me know. The buffet area is my own discretion for the most part and requests of course." Of course though it was her discretion, she was told to keep it smooth for the most part unless it was a request. So either smooth jazz or classical... But she'd be fine with the guests shaking things up of course. Then she heard Dash talk about models and being awesome. "Heh, I dunno 'bout that. I sometimes am around Manehattan during fashion week...." Dissy paused Fashion Week... Rarity...? She wasn't interested in fashion but... there was that newcomer who shook things up apparently, one of her colleagues who played fashion week raved about her designs. "Some of the models during fashion week are definitely "awesome." It all depends on the designer, ya know? I think ya'd fit right in as a model." She turned to Miss Rarity, once again switching to standard Canterlot accent. "Pardon me for being forward Miss Rarity, but.. mentioning fashion week... one of my colleagues mentioned a mare who had some progressive designs that ended up winning... that wasn't you... was it?"